All classes held at the Haverhill Valley Forum! Join the Northeast Ice Skating Club’s accredited Learn to Skate Program! Using Learn to Skate USA (formerly U.S. 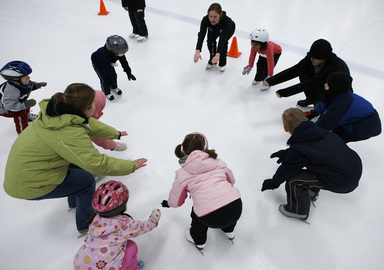 Figure Skating) guidelines and experienced, accredited coaches, you will learn the basics of ice skating in a fun & supportive environment. Your skater will build a strong foundation easing the transition to competitive hockey and figure skating or to just enjoy recreational skating. Skaters are broken up into groups by skill level & desired curriculum. All ages & abilities are welcome. Sign up ONLINE or at the rink before any class (CASH OR CREDIT ONLY)! ​*Plus $25 annual registration fee for skaters new to the 2018-2019 season which began 7/1/18. Each session is a non-refundable registration fee. All skaters 3 & up are also welcome to join our Thursday 6:10pm or Saturday 12:10pm classes. Register for spring 2019 Classes here! - Professional coaching staff with many years of combined experience.